H.H. Prince Karim Aga Khan IV | Ismaili.NET - Heritage F.I.E.L.D. Imam, Spiritual Leader of the worldwide Shia Imami Ismaili Muslim Community and head of the Aga Khan development Network. 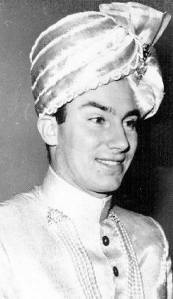 His Highness the Aga Khan is the 49th hereditary spiritual leader (Imam) of the Ismaili Muslims, and founder and Chairman of the Aga Khan Development Network (AKDN). Over the past 40 years the AKDN has grown to encompass development agencies, institutions and programs with mandates ranging from health and education to economic development and the revitalization of cultural heritage. All AKDN programmes are conducted without regard to the faith, origin or gender of the people they serve. The Aga Khan has emphasized the view of Islam as a thinking spiritual faith, one that teaches compassion and tolerance and that is inherently pluralistic. 2010, February 2-4: Paris, France - Prince Karim Aga Khan attends the International 'Global Zero' Summit Against Nuclear Weapons. 2010, January 28 - London, UK: "Results change minds, not rhetoric." His Highness the Aga Khan's statement at the London Conference on Afghanistan today. International conference on Afghanistan begins in London - Foreign ministers of over 70 countries gathered at a conference in London to discuss the current situation and future of Afghanistan. A virtually unknown film from 1961 of Karim Aga Khan as he recently takes over the mantle of the Imamat. In an interview with Deutsche Welle, Prince Karim Aga Khan IV, the hereditary imam of Shiite Ismaili Muslims, argues that today's Middle Eastern terrorists are fueled by political motivations and not religion. Slideshow of H.H. The Aga Khan's 2007 Golden Jubilee Visit to Dubai, UAE. background music is Qasida Dam Hamma Dam by Shamsh Tabriz, sung by Karim Khan.